I picked up this owl vase at Michael's about a month ago. I love how their home decor switches so often that you can almost always count on finding items 40-50% off. I snagged the last one of these off the shelf for around $8. I decided to use it in our kitchen, although now I wish I had another to put on our bookshelf. 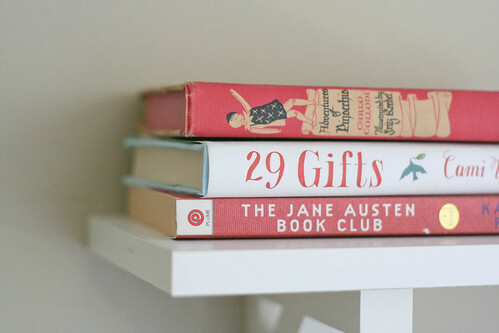 It reminds me of something you'd find at Anthropologie, which is rather delightful—considering it was so inexpensive! My mom and youngest sisters recently treated me to a handful of unexpected gifts, and this tape dispenser was one of them. It's been on my wish list for ages, and I may have gotten a bit weepy (in the best way) when I opened one of the gifts and found this inside. I have the sweetest family, for sure. 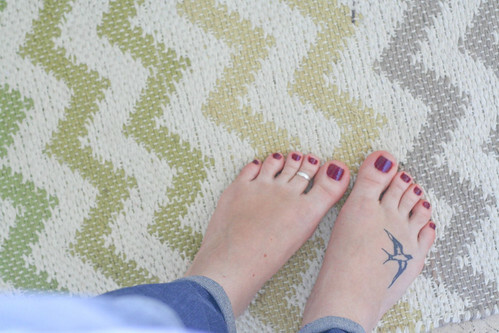 A chevron rug! For our kitchen! And it was only $13! Heck, yes! Sometimes I get too excited about things. This is true. Since we recently had to move everything out of our duplex (save for the bathroom and kitchen) for our carpets to be cleaned and re-stretched, I had the chance to completely re-organize our bookshelf. For someone like me, that is basically an early Christmas gift. 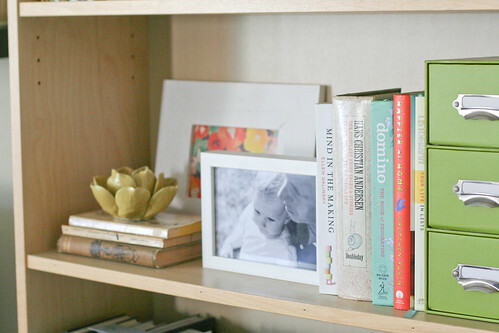 The shelf above is my new favorite—especially the photo of Jay and Eisley, which I took on her first birthday. 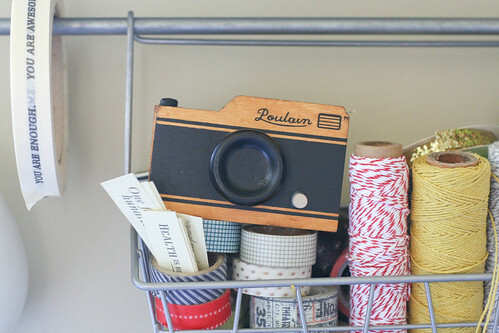 And once again, my love of washi tape is clearly displayed here. I took down the paper banner I've had hanging above Eisley's changing table for the past almost-two-years. I was eager for a change, and decided to tape up a few of my favorite photos from the past year. I love little changes that make me smile whenever I walk by. You really need to be an interior decorator -- or at least mine, lol. I love your style! You're so sweet, Kristan! Thank you! It took me a long, long time to really create/perfect my personal decorating style. You should see how our first apartment looked right after I got married. Yikes! I wish you would come over an decorate my house! I love your style! I agree with the others--you really do have an eye for making spaces beautiful and personal but at the same time keeping them simple and clean. You're so sweet—thank you! :) And thank you for the compliment on my tattoo, too…I still love it so much, and it's new enough that sometimes it still surprises me that it's there. Ha! Oooo, your house! I love your little space so much. It's so warm, so inviting and I l-o-v-e that owl!!! 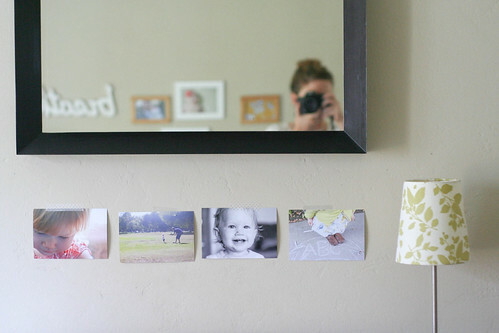 Love those photos of your daughter taped to the wall! Such a sweet and simple idea!! 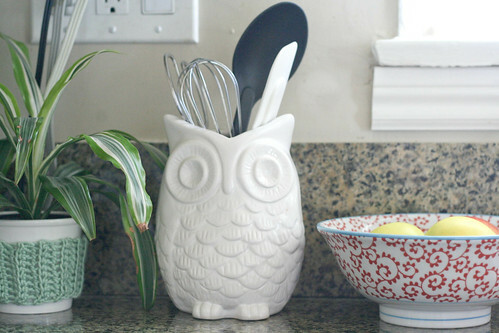 And love both the owl vase and the carpet, for the price, and the cuteness! Can we talk about how hard you're rocking that toe ring, because, girl!